Ruby Nishio featured in one-woman show in Highland Park. At age 90, award-winning quilt maker Ruby Nishio gives intensity and boundless energy to her second one-person show at Future Studio Gallery. Vibrant color. striking contrasts, impeccable craft and exquisite hand sewn detail distinguish her work. An artist’s tea will take place on Sunday, May 21, from noon to 3 p.m. The artist will be present. Nishio pulls her iconography from her deep and varied interests: gardening, traveling, personal history and the life around her. She stitches fabric pieces together to form thematic patterns, unique color fields and profoundly resonant narratives, then meticulously hand-quilts them into exquisite works of art. The 600-year-old historic Temple of the Golden Pavilion in Kyoto is represented by two quilts in the exhibition. In “Kinkakuji” (2007) the beauty of the main temple’s interior is represented by Nishio’s many small fine piecing and hand quilting. The “Golden Palace” (2011), on the other hand, depicts the splendor of the temple reflected in the shimmering pond against the sprawling expanse of rock gardens, moss gardens and koi gardens. In addition to her large quilts, Nishio will also be showing a collection of smaller pieced and quilted works in the form of custom-designed pot holders made especially for this exhibit. Because of their small size, Nishio was able to juxtapose the playfulness of design and fabric is a variety of patterns. Even the harsh conditions in a World War II camp did not deter Nishio from creating beauty from the world around her. The flowers were made from crepe paper applied to found dessicated pine branches. Nishio was 15 years old, attending Belmont High School in Los Angeles, when in 1942 she was forcibly detained along with her parents and three siblings at Heart Mountain in Wyoming. Upon her release, she moved to Cleveland, Ohio, then found her way back to Los Angeles, where she began developing her life-long passion for sewing by fabricating custom-designed wedding gowns. Sewing for over 75 years, Nishio transitioned to quilt-making in 1992, with side ventures knitting, tatting, crocheting and embroidery. 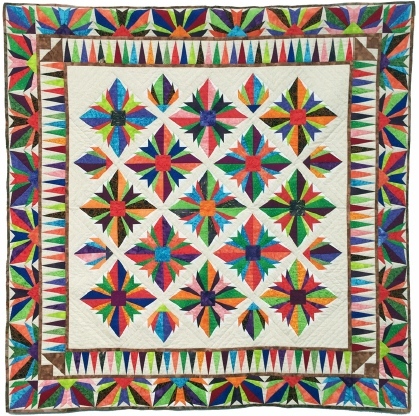 Her years of experience in these related disciplines are evident in her quilts. Just as her interest in dressmaking took her from making her own simple clothes to producing custom wedding gowns, Nishio’s quilt-making incorporates a lifetime love of gardening, an innate sense of color field relationships and an impeccable instinct for harmony into expressive, timeless and resonant works of art. Future Studio is located in Highland Park at 5558 N. Figueroa St., Los Angeles. More info at futurestudio.typepad.com.